Hawaii freshman Davone Bess reeled in a touchdown reception in front of New Mexico State's Alex Bernard in the first half of last night's game at Aloha Stadium. From his spot on the sidelines, Nick Rolovich could only watch as his place in the Hawaii record books was threatened. 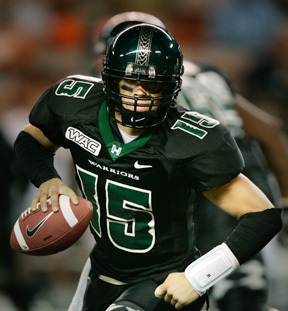 Rolovich -- he of the legendary 543-yard, eight-touchdown performance against Brigham Young in 2001 -- looked on last night as UH quarterback Colt Brennan piled up the yards and the points for a Warriors offense that took the run out of the run-and-shoot against New Mexico State. In the end, Rolo's records survived another week as Brennan finished with 515 yards and seven touchdowns in leading UH to a 49-28 homecoming win over the Aggies at Aloha Stadium. "Like what Dan Robinson told me, his records were going to get broken, mine are going to get broken," said Rolovich, now a UH graduate assistant. "Someday he'll get them." Brennan didn't give the ball to a UH running back until the fourth quarter, placing it instead in the hands of UH's receivers to fuel the team's most productive offensive performance of the season and end a two-game skid. Hawaii improved to 2-4 overall and 2-2 in the Western Athletic Conference in earning its first home win of the season before a crowd of 24,775 (29,002 tickets issued). New Mexico State lost its eighth straight dating back to last season and dropped to 0-7 and 0-3, and is still looking for its first WAC win in its inaugural year in the league. Hawaii quarterback Colt Brennan went 38-for-53 for 515 yards and seven touchdowns during last night's game against New Mexico State. Brennan shredded the NMSU secondary for five first-half touchdown passes as the sophomore completed 38 of 53, leading UH to 628 yards in total offense. "We just wanted to silence the critics," Brennan said. "After we came out after the first touchdown, (UH coach June Jones) looked at me and said, 'It's going to be a big day for you.' "
Brennan also accounted for 46 of UH's 97 rushing yards, all coming on scrambles after not finding a receiver open downfield or to escape pressure. Most of the Warriors' ground yardage came in the fourth quarter with the game out of reach. "We practiced all week on having this set idea of what (NMSU was) going to do and they did it. So we took full advantage of that," Jones said. "This is a glimpse of what the run-and-shoot offense can do and it should just be another day at the office for us." Chad Mock, making only his second start, benefited most from Brennan's career night. The junior from Farrington caught 10 passes for 147 yards and a touchdown, the first of his career. "I thought last year he was going to be our best receiver," Jones said. "Finally, he got his chance to play and I don't think he's going to give it up." But Brennan distributed the ball evenly, as five receivers had at least five catches and three topped the 100-yard mark. Ryan Grice-Mullen had nine receptions for 147 yards and a career-high four touchdowns. Davone Bess finished with seven catches for 128 yards and a touchdown. Running back David Farmer, starting in place of an injured Nate Ilaoa, had seven receptions for 52 yards, and finally got an opportunity to run the ball with 11:14 left in the game. Brennan led UH to scores on five of six possessions in the first half as UH opened up a 35-21 lead at halftime. 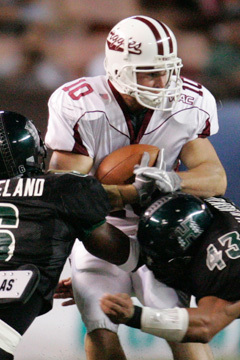 Hawaii's Tyler Graunke got pulled down by NMSU's Brandon McKinney in the fourth quarter last night. Despite the offensive explosion, NMSU was able to keep the Warriors from getting too comfortable in a first half that resembled a tennis match as seven of the game's first 10 drives ended in touchdowns. NMSU quarterback Royal Gill passed for 356 yards and two touchdowns, while running back Justine Buries rushed for 99 yards and two scores as the Aggies racked up 503 total yards. The Hawaii defense slowed the flow of points in the second half, limiting the Aggies to a fourth-quarter TD with the game already out of reach. The offense added two second-half scores and the Warriors cruised to the win. UH linebacker Kila Kamakawiwo'ole led the Warriors defense with nine tackles, including one of UH's three sacks. "We got a lot better on offense tonight. Not so much on defense, but a lot of that has to do with June's offense," NMSU coach Hal Mumme said. "We'll have a better scheme next time. "The trip is difficult. ... We're still learning our personnel. Playing Hawaii is a good learning experience. We did a poor job tackling, but that's more a credit to June than a cut on our defense." UH's special teams set the tone early as A.J. Martinez, playing for the first time this season, returned the opening kickoff 67 yards to the NMSU 30. The Warriors then took six plays to open the first-half scoring binge. Brennan hit Ross Dickerson in the right corner of the end zone for a 3-yard score to put UH ahead. After Brad Kalilimoku pounced on a fumbled snap to halt New Mexico State's first possession of the game, UH drove 74 yards and extended the lead with a 15-yard strike from Brennan to Grice-Mullen. After spotting UH a 14-0 advantage less than 6 minutes into the game, NMSU joined in the scoring with a 91-yard march ending with Buries' 12-yard run off the left side. UH then lost the ball on downs and NMSU punted for the only lull in the scoring run, which resumed when Brennan hit Grice-Mullen in the right corner early in the second quarter for a 21-7 UH lead. Although the Aggies scored twice more in the half, the Warriors held serve to take a 14-point cushion into the break. NMSU threatened to cut into the UH lead early in the second half, extending its opening drive when backup quarterback Joey Vincent threw a 17-yard pass to Nick Cleaver on a fake punt on fourth and 15 from the Aggies 29. NMSU tried the fake again later in the same drive, but this time Vincent was sacked by Lamar Broadway. UH got some separation from the Aggies on Brennan's fourth TD connection with Grice-Mullen with 3:49 left in the third quarter. The play completed a 94-yard drive that took just 2 minutes, 19 seconds. One play after the Warriors finally called a run early in the fourth quarter, Brennan lofted a 44-yard scoring pass to Mock to put UH up 49-21 with 10:44 left. Brennan finally gave way to Tyler Graunke in the final moments as UH secured the win. "He tried to tell Coach he wanted to go back in. I said 'Coach, coach, he can't go back in,' " Rolovich joked. Hawaii's Kila Kamakawiwo'ole went airborne to bring down New Mexico State running back Justine Buries in the first half of last night's game at Aloha Stadium. Hawaii's Ryan Grice-Mullen leaped over New Mexico State's Gill Byrd, 25, Eric Carrie, left, and Spencer Moore for a touchdown in the second quarter. New Mexico State receiver Paul Dombrowski braced himself for a hit by UH's Turmarian Moreland and Brad Kalilimoku during the first half of last night's game. 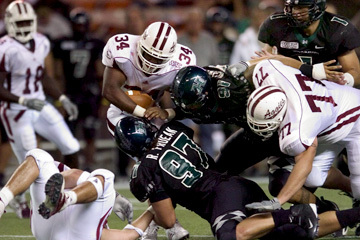 Hawaii defenders Renolds Fruean and Ikaika Alama-Francis stopped New Mexico State's Justine Buries last night. Hawaii's Ross Dickerson caught a pass for a touchdown in front of New Mexico State's Shukree Shabazz in the first quarter last night. Officials -- Referee: Bill McCabe; Umpire: Robert Baker; Linesman: Rich Chandler; Line judge: Terry Wilson; Back judge: Bob Taylor; Field judge: Scott Monaco; Side judge: Bill Baraya; Scorer: D. Young. Rushing -- NMSU: Buries 23-104, Harris 1-18, Gill 7-14, Romaka 1-6, Williams 2-2, TEAM 1-0, Vincent 1-0, Dubois 2-0. Hawaii: Brennan 9-49, Cox 5-25, Graunke 3-15, Farmer 1-11. Passing -- NMSU: Gill 34-57-1-356, Vincent 2-3-0-35. Hawaii: Brennan 38-53-1-515, Graunke 2-6-0-16. Receiving -- NMSU: Cleaver 8-103, Harris 6-91, Allen 6-38, Dubois 4-57, Dombrowski 4-32, Buries 3-29, Baiamonte 2-14, Jones 1-18, Hobson 1-6, Romaka 1-3. Hawaii: Mock 10-147, Grice-Mullen 9-137, Bess 7-128, Farmer 7-52, Dickerson 5-51, Olchovy 1-12, Bain 1-4. Tackles for loss-yards -- NMSU: McKinney 1-3. Hawaii: Kamakawiwo'ole 2-15, Moe 1-3, Brodway 1-3, Lafaele 1-2, Noa 1-7, Keomaka 0.5-1, Fruean 0.5-1. Sacks-Yards -- NMSU: McKinney 1-3. Hawaii: Kamakawiwo'ole 1-14, Broadway 1-3, Noa 1-7. Fumbles forced -- NMSU: Bernard. Hawaii: Kamakawiwo'ole. Fumbles recovered--NMSU: Griebel. Hawaii: Kalilimoku, Moe. Interceptions -- NMSU: Bernard. Hawaii: Moreland. Passes broken up: NMSU: Bernard, Carrie, McKinney, Cottrell. Hawaii: Elimimian, Moreland, Broadway, Patton, Perry, Alexander. Kicks blocked -- NMSU: None. Hawaii: None. Quarterback hurries -- NMSU: Howell, Spicer. Hawaii: Alama-Francis, Akpan, Kamakawiwo'ole, Moe, Watson, Wilson, Kafentzis, Fonoti.